Well, after 11 years, it's finally time to let go. Our major project for the year is redecorating our master bedroom. Not that we minded the too-dark navy blue wallpaper with little flowers all over it, but well, it's era has come to an end. 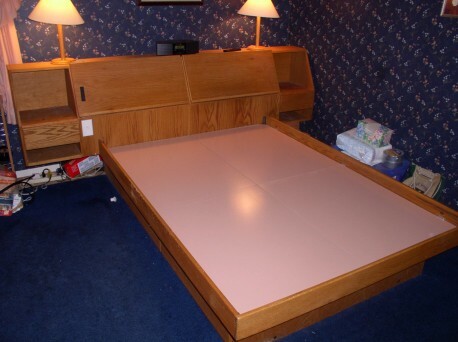 It all started when we realized that Trish needed a lower bed to make transfers easier, safer, and more independent. Modern beds require a flight of stairs to get into them anymore, so this was proving to be a real challenge. Lo and behold, we discovered that others feel this way, too, but the selection is fairly limited. Then, last year, Trish took a "test rest" at the Select Comfort store in Arundel Mills Mall. It was there she discovered that not only do some of the beds come in reasonable heights for very short people, but you can actually order them with itty-bitty legs! That was all Trish needed to hear. Our first step was to remove our Big Behemoth Platform Bed, which had a giant footprint, despite only having a full-size mattress. John received it as a graduation-from-college gift from his parents, and we're convinced that it is so solid it will be around for at least another thousand years. For now, it will find a new home with Trish's brother. Take a gander at the old bed, just before it was torn down and removed... you'll see a pretty good view of our "we're sure it was all the rage in the 80s" wallpaper, too.